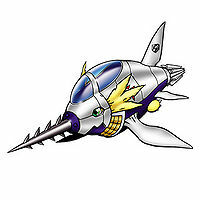 An Armor-level Aquatic Digimon that evolved through the power of the "Digimental of Sincerity". 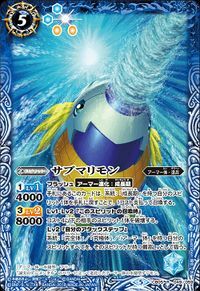 The "Digimental of Sincerity" has the attribute of "Water", and those that don this Digimental demonstrate their true power underwater. It swims freely around the ocean, and the techniques unleashed in underwater battles are no match for it unless they're also from a considerably Aquatic Digimon. 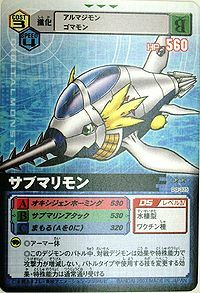 Its Special Moves are discharging super-compressed oxygen (Oxygen Homing), and after distancing itself underwater, instantly accelerating and performing a ramming attack while spinning the drill on its snout (Submarine Attack). Title: 「渦巻く誠実」 — "Whirling Honesty"
Short for Submarine (「サブマリン」 Sabumarin). 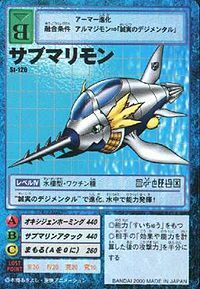 Anime/Manga Digimon Adventure 02: "Submarimon's Escape from The Bottom of the Sea"
Oxygen Homing  オキシジェンホーミング Okishijen Hōmingu Oxygen Torpedo/OXY Homing Missile Discharges super-compressed oxygen. Shoots a water stream from its backside. Assumes a distance while underwater, quickly ramming the opponent while the nosetip drill is spinning. Submarimon is the partner of Hida Iori. Submarimon is the partner of Mizuki. They met shortly after she received a Xros Loader from Watch Man. He is extremely loyal and enjoys exploring the ocean and going treasure hunting with her. 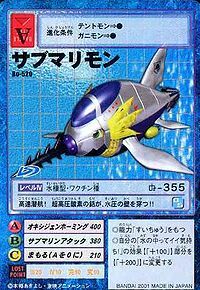 Submarimon is only obtainable as a collectible card. Its card is part of the Digimental of Sincerity (誠実のデジメンタル Seijitsu no Dejimentaru) set. 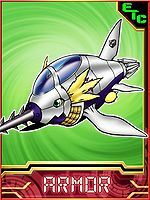 Submarimon is available as a Digimon Medal. Submarimon is an obtainable armor evolution of Armadimon. 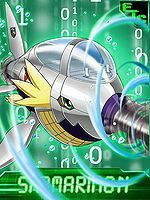 Evolving using the "Digimental of Sincerity", it displays its abilities underwater! High speed submersion! Its high-pressure oxygen harpoons pierce through the wall of water pressure!! The Armor Evolved form of Armadimon using the Digimental of Sincerity. Possessing the water element, it is capable of unhindered performance while underwater. 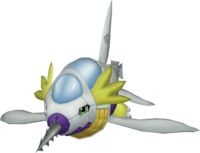 It boasts underwater abilities that surpass that of regular Aquatic Digimon. 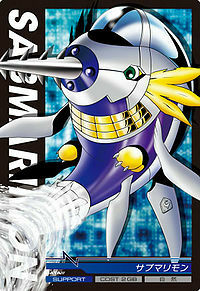 An Armor-level Aquatic Digimon that evolved through the power of the "Digimental of Sincerity". ↑ Digimon Adventure 02: "Submarimon's Escape from The Bottom of the Sea"
This page was last modified on 18 March 2019, at 22:21.